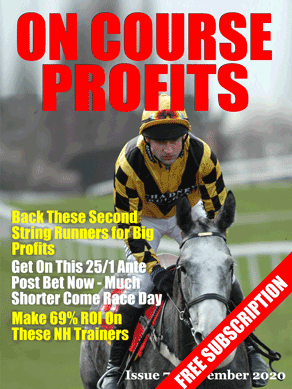 I'm just catching up with my Racing Ahead magazine (available in all good newsagents). One of the features I like to keep an eye on is the jockeys and trainers performance tables for the upcoming month. The first interesting thing about this top 3, is that they are all National Hunt trainers and we're not in the main National Hunt season. There are many other profitable trainers in the list and we'll look closer at them another day, but for now let's keep an eye on Nigel Twiston Davies runners this month. He has nothing today, but 3 entries tomorrow.